Losing one or two teeth seems trivial. We have 32, so a few to spare, right? Not in the least! Some patients even believe that tooth extraction is a quick and easy fix to their dental problems. Just one tooth loss can lead to severe consequences down the road. Basically, we want our patients to appreciate what their teeth do for them and not take it for granted. Premier Family Dental truly cares about your overall health both now and in the future. If you find yourself needing a tooth replacement anyways, your dentist in Waco, TX, Dr. Cofer, offers great tooth replacement options. That’s right, he can complete the full process of dental implants all within this one practice. There are many ways that you may end up facing tooth loss face to face. Besides the embarrassing sagging facial appearance that has a heavy aging effect, missing teeth can severely affect the rest of your dental health. Let’s take a look at which dangers you are facing by missing one or more key components of your smile. You can suffer from gum and bone recession. If your jawbone does not get enough “exercise” from the normal pressures of chewing, it will start to recede and deteriorate. This doesn’t just take place where the tooth once was, but it extends to other areas, putting your other teeth at risk. Your other teeth will start shifting. The movement of your teeth affects the so many aspects of your oral health! Your remaining teeth could become crooked or overlapping, making it more difficult to clean. This could lead to tooth decay. Your bite could also change and you may need orthodontic work to realign your teeth. Finally, your jaws could be affected. 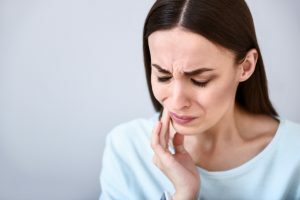 You will be at higher risk for TMJ disorder. You will have to change your eating habits. The loss of even a single tooth can greatly affect your eating habits. Patients dealing with these problems tend to eat easily chewable, digestible, and high-processed foods. Basically, you’re more at risk for food-induced health diseases because these foods are lower in nutritional value. You may not be as confident. Sometimes, some patients experience difficulties just speaking normally, especially if they are missing a front tooth. Dr. Cofer can really help restore the functionality and beauty of your smile all under one roof! Most dentists start completing dental implant procedures after a single weekend course, but your dentist has 192 hours of study about dental implants in Waco, TX! Dental implants are the most natural-looking tooth replacements and are easy for your body to adjust to once placed. They support your jawbone, preventing bone loss and keeping your bite strong. Our office makes this procedure convenient for the residents of Waco and all surrounding areas like Robinson and Lorena. If you would like to discuss possibly getting dental implants with Dr. Cofer, contact our Waco office today to schedule an appointment! by: Dr. Rick Cofer at March 21, 2017 .